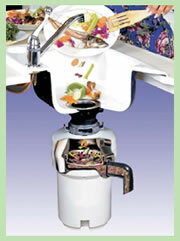 What is a Waste Disposer? In basic terms the aim of the Food Waste Disposer is to simply and safely grinding food waste into very fine particles, which are then flushed through the waste pipe. Are these particles it creates okay for the sewage system? Decades of scientific studies have shown this to be a sound ecological alternative. At sewage treatment facilities, the food waste can be converted into useful energy, or recycled into agricultural fertilizer. Why can't I just compost? Not everyone has the space to compost although this could be used as a partial option for food waste disposal. There is a distinction between acceptable composting materials such as green waste (raw vegetables, fruit peels) versus non-acceptable putrescible food waste (proteins: meat, fish, dairy products, plus cooked foods) The latter can obviously encourage an infestation of insects or rodents. Will the Waste Disposer fit in my sink? All Waste Disposers featured on this website are designed to fit all 90mm sink waste outlets to an overall sink thickness of 24mm. If the thickness is greater than 24mm an extending sink flange (up to 45 mm) is available. When non-stainless steel sinks are included in the design package, the installer should use a silicone to ensure a watertight connection is made to the sink flange/sink. What's the difference between a Continuous & Batch feed model? Continuous Feed: food can continually be added during the grinding process. Both types use the same grind mechanism, but adopt different styles to activate power.